Housed in the Chapter Library are many volumes which would have appealed to those Canons who liked to think of themselves as antiquaries, individuals involved in the study of antiquities. Numerous books on coins, local history, genealogy and ancient monuments fill the shelves as these men satisfied their curiosity over the past. The study of antiquity called for the descriptions of ancient institutions, religion, law and finance, recovering ancient civilisations through the systematic and often meticulous study of its relics, objects, archaeology and surviving manuscripts, with a clear focus on the empirical evidence. These men followed in the footsteps of their Roman and Greek counterparts, Pliny the elder, Plutarch and Livy. During the Middle Ages, antiquarianism focused on the copying of manuscripts, a practice which has enabled many texts to survive that would otherwise have been lost. However, it was during the Renaissance that antiquarianism really flourished. These manuscripts were critically studied and analysed, and cabinets of curiosities were created, containing coins, cameos, gems, natural objects such as shells or skeletons, and all sorts of memorabilia from far off lands. One of the most well-known in England was Tradescant’s Ark, the collection of materials picked up by gardeners John Tradescant the elder and his son on their travels searching for new plants in the early 17th century. Open to the public for a small fee, it went on to form the basis of the Ashmolean Museum. With these tools, the ancient worlds could be scrutinised in minute detail. The seventeenth and eighteenth centuries saw a shift away from the study of numismatics and documentary evidence towards the study of archaeological remains as The Grand Tour became part of the life of the upper classes. This increased exposure to Roman ruins brought a greater interest in the people who had created them. 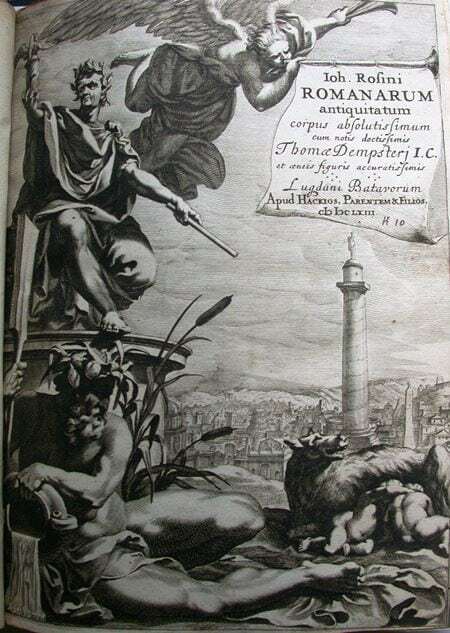 J. Rossfeld, a German scholar, was the first to publish a handbook on Roman antiquities, called Joannis Rosini Antiquitatum romanarum corpus absolutissimum [SGC RBK R.170]. A large number of individual texts were being published, and this was an attempt to bring these studies together. As a result, it is a comprehensive survey of the history of ancient Rome, with chapters on the pantheon of gods, their worship, and those priests who followed them; the clothing worn by the different social classes; politics; the Roman calendar; and all aspects of human life including marriage and funeral rites. It was first published in 1583, a century before the Grand Tours really took off, and went through several editions. The edition in the Chapter Library dates from 1663. It contains illustrations of Roman life, including gladiator fighting, costumes, banquets and coins, a map of ancient Rome, and this magnificent frontispiece showing an Emperor surveying the city, while Romulus and Remus suckle in the background.